A movingly told British import about a teen girl with cancer treads some familiar ground. When Megan arrives at a children’s hospital to receive her first round of chemotherapy, she immediately meets Jackson Dawes. 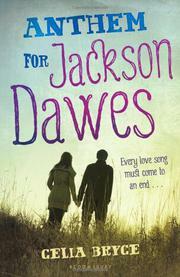 The only other teenager in the hospital wing, Jackson is quirky, mischievous, charismatic and great with children. He immediately insinuates himself into Megan’s life by popping into her hospital room. His company at first irritates, then delights her. As Megan’s illness begins to distance her from her school friends, she finds comfort and companionship in the cancer ward’s kind nurses and lovable children. She finds it especially in Jackson, who comforts her with Jamaican storytelling and helps cut her hair when it starts to fall out. The third-person narrative voice is evocative and observant, and Megan’s changing relationships with friends, family and fellow sufferers are compelling. It is difficult, however, to read a contemporary teen cancer story without recalling John Green’s The Fault in Our Stars, which masterfully dismantled cancer-related clichés. Here, many of the tropes Green addressed are left unexamined: A noble Cancer Kid remains full of life until the very end; a death is made easier by platitudes and the knowledge that the dead person’s family has contributed to other children’s fight against the disease.